Here the Kammerorchester Berlin is led by its founder Helmut Koch, delivering performances of J.S. 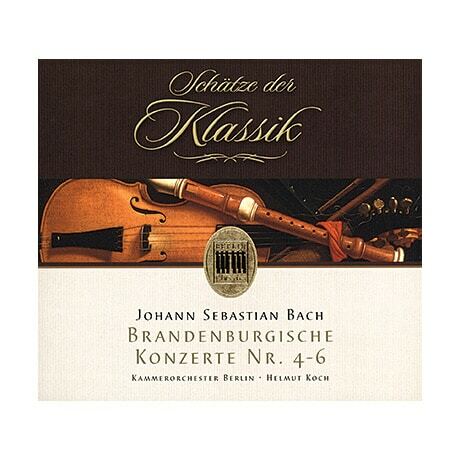 Bach's Brandenburg Concertos nos. 46 that possess an authentically baroque self-control, free of the Romantic-era excess that some performers interject into Bach's works. The harpsichord solo in the fifth concerto's allegro movement is nonetheless as breathtaking as it should be, while the Concerto no. 6, BWV 1051, is simply ravishing, with each of its three movements vying for the distinction of being the most noteworthy. Bach's Concerto no. 4, BWV 1049, has a sorrowful andante on this 1971 recording, but the presto movement brings the piece to a cheerful conclusion.